Support for an Intel® Core™ i7 series processor in the LGA1366 package. North Bridge: Intel® X58 Express Chipset. 6 x 1.5V DDR3 DIMM sockets supporting up to 24 GB of system memory. Support for DDR3 2200/1333/1066/800 MHz memory modules. Support for non-ECC memory modules. Support for Extreme Memory Profile (XMP) memory modules. Support for Dolby® Home Theater. 2 x RTL8111D chip (10/100/1000 Mbit). 2 x PCI Express x16 slots, running at x16 (PCIEX16_1/PCIEX16_2). 2 x PCI Express x16 slot, running at x8 (PCIEX8_1/PCIEX8_2). 2 x PCI Express x1 slots. Support for 2-Way/3-Way ATI CrossFireX™/NVIDIA SLI technology. 6 x SATA 3Gb/s connectors (SATA2_0, SATA2_1, SATA2_2, SATA2_3, SATA2_4, SATA2_5) supporting up to 6 SATA 3Gb/s devices. Support for SATA RAID 0, RAID 1, RAID 5, and RAID 10. 2 x SATA 6Gb/s connectors (GSATA3_6, GSATA3_7) supporting up to 2 SATA 6Gb/s devices. Support for SATA RAID 0, and RAID 1. 1 x IDE connector supporting ATA-133/100/66/33 and up to 2 IDE devices. 2 x SATA 3Gb/s connectors (GSATA2_8, GSATA2_9) supporting up to 2 SATA 3Gb/s devices. Support for SATA RAID 0, RAID 1, and JBOD. 2 x eSATA 3Gb/s connectors (eSATA/USB Combo) on the back panel sup- porting up to 2 SATA 3Gb/s devices. 1 x floppy disk drive connector supporting up to 1 floppy disk drive. Integrated in the South Bridge. Up to 10 USB 2.0/1.1 ports (6 on the back panel, including 2 eSATA/USB Combo, 4 via the USB brackets connected to the internal USB headers). Up to 2 USB 3.0/2.0 ports on the back panel. Up to 3 IEEE 1394a ports (2 on the back panel, 1 via the IEEE 1394a bracket connected to the internal IEEE 1394a header). 1 x 24-pin ATX main power connector. 1 x 8-pin ATX 12V power connector. 1 x floppy disk drive connector. 8 x SATA 3Gb/s connectors. 2 x SATA 6Gb/s connectors. 1 x CPU fan header. 3 x system fan headers. 1 x power fan header. 1 x North Bridge fan header. 1 x front panel header. 1 x front panel audio header. 1 x CD In connector. 1 x S/PDIF In header. 1 x S/PDIF Out header. 2 x USB 2.0/1.1 headers. 1 x IEEE 1394a header. 1 x PS/2 keyboard port. 1 x PS/2 mouse port. 1 x coaxial S/PDIF Out connector. 1 x optical S/PDIF Out connector. 1 x clearing CMOS button. 2 x IEEE 1394a ports. 4 x USB 2.0/1.1 ports. 2 x eSATA/USB Combo connectors. 6 x audio jacks (Center/Subwoofer Speaker Out/Rear Speaker Out/ Side Speaker Out/Line In/Line Out/Microphone). 2 x 16 Mbit flash. Use of licensed AWARD BIOS. PnP 1.0a, DMI 2.0, SM BIOS 2.4, ACPI 1.0b. 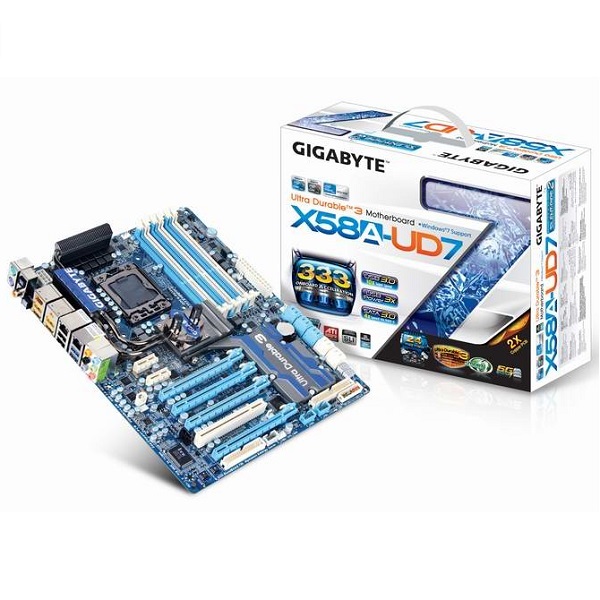 Support for Xpress BIOS Rescue. Support for Dynamic Energy Saver™ 2. Support for eXtreme Hard Drive. Norton Internet Security (OEM version). Clique no botão abaixo para adicioná-lo Placa Mae GIGABYTE GA-X58A-UD7 Socket LGA 1366 (X58A-UD7) para sua Lista de Favoritos.